Uglyworld #1166 - Stripereds Shortiebreaders (Project BIG - Image 179 - 365), a photo by www.bazpics.com on Flickr. As you knows I has a megas craving for triples choco chipper cookies almost constantlies, but afters tonights visitor to the super-dupers-marketer I finders somethings so amazings that I couldn't believers my owns eyes. 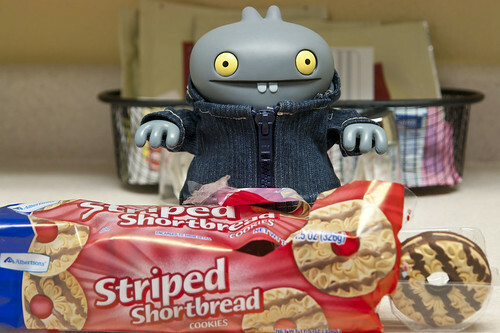 I lovers eatings the shortiebreaders cookies everytimes I goes to Scotlands, so when I findered a packeter of Stripereds Shortiebreaders on the shelfs I just hads to haves some to checkers out how they tastereds! I just cant's stoppers eating thems, I has demolishered almosts half the packeter alreadies and does you knows what? Yuppers, I still wants more of thems!